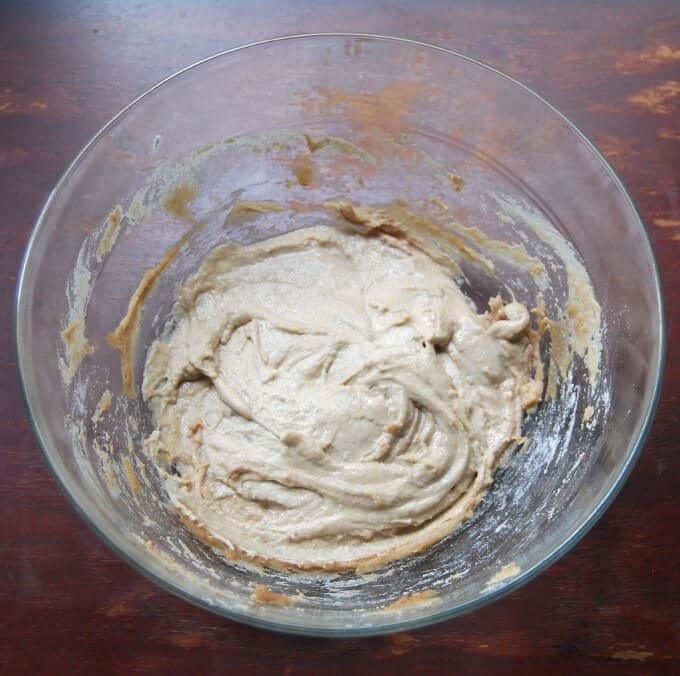 Some readers had asked for the recipe for my sourdough starter, so here it is. It’s hardly a recipe because it requires just two ingredients, flour and water, but there is some patience and technique involved, and ensuring your sourdough starter stays at the right temperature. If you make it, you will forever have a great reason around to bake bread…and pancakes, and waffles, and pizza, and pretzels, and all those wonderful things you can do with sourdough. George, my sourdough starter, has been around for nearly three months now and he’s quite mature with a lovely tang. I just made some pumpkin pie waffles this morning with him, adding a cup of pumpkin puree to my sourdough waffles recipe, instead of the flaxseed, and some vanilla and cinnamon. 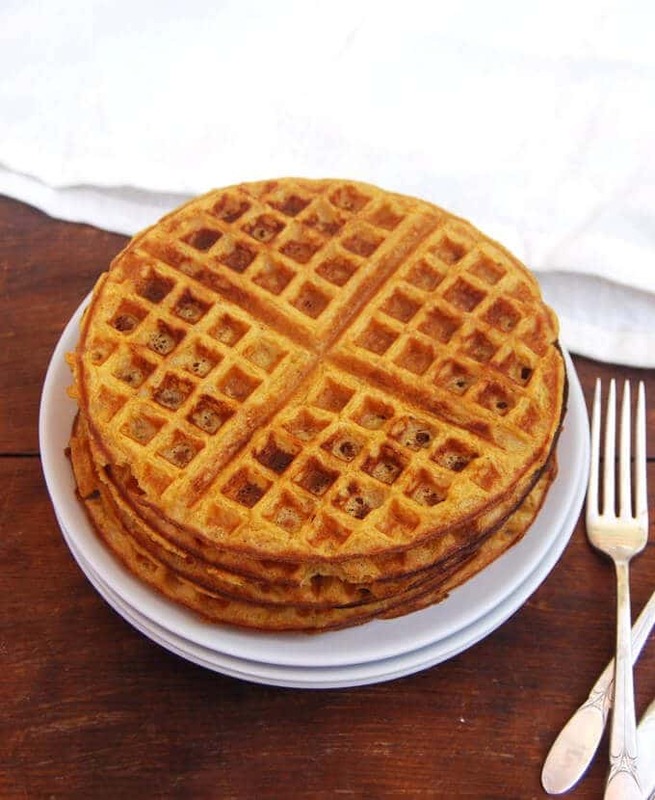 I love this sourdough waffle recipe so much, I’ve pretty much stopped making waffles with baking powder, and it’s a win-win because sourdough is so much healthier for me and my family. 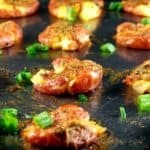 I will go through this process with you step by step, with photos, or you can just scroll down for the recipe. Make it today, and you might have a batch of sourdough ready to mix up into waffles or a bread by the end of this week. Measure out 1 cup of whole wheat flour into a large bowl or a crock (if you live in India, you can use whole wheat atta flour). The container you use should be large enough to hold the sourdough starter as it rises and bubbles. Also make sure you use a glass or ceramic or sturdy, food-safe plastic container. 2. Measure out 3/4th cup of bottled or non-chlorinated, room-temperature water. Chlorine can inhibit the formation and growth of yeast, so it’s rather important that your water be as non-chlorinated as you can get it. 3. 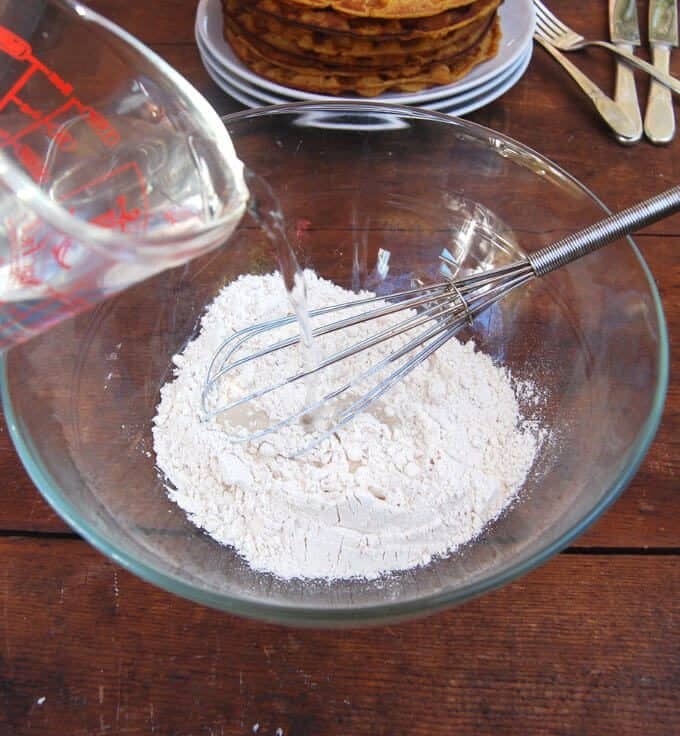 Now add the water to the flour and whisk together to mix well. You should not have any traces of flour. 4. Cover the sourdough starter loosely with a kitchen towel. 5. If the weather where you live is cold, place it in a warm spot, like on top of a radiator or in an oven with the pilot light on. It was rather warm here when I started George so I could leave him out on the kitchen table, but this time — with temperatures kissing the 40s — I have my new starter in the oven with the light on. Keep in mind that it may take longer for the yeast to develop in the starter in cooler weather. 6. Leave your starter alone for 24 hours. When you look at it, you might see some bubbles, or there may be none, especially if you are in cooler temperatures. Either way, mix the starter well with a whisk or fork, measure out half a cup of the starter, and discard* it. Although it might hurt you to do so, this “waste” is important so you can have a great starter in a few days’ time. 7. 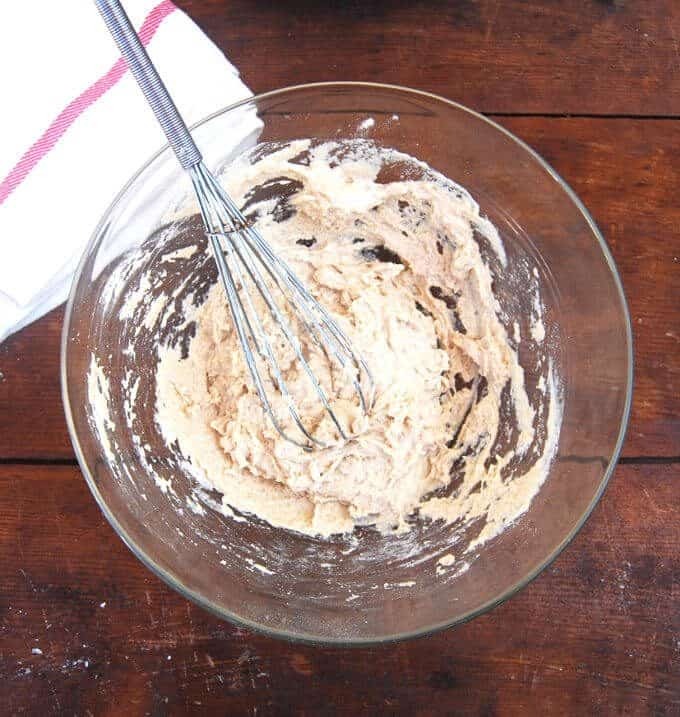 After discarding a portion of the starter, add half a cup of unbleached, all purpose flour and 3/4 cup of non-chlorinated water. Use warm water (not hot) if you are working in cool temperatures, as I am. Mix well and again, leave in a warm place. You will start noticing that your starter lightens in color with the addition of all purpose flour. Sourdough starter on day 2, after feeding with 1/2 cup of flour and 3/4 cup water. You can already see yeast bubbles forming — how exciting! This is a rather high proportion of water I added today (150 percent) but I did it because the starter was rather stiff. I will revert back to a 1:0.75 proportion of flour to water on day 3. 8. By the third day you should see some activity in your starter and also a fruity aroma. Once again, discard half a cup of starter and add half a cup of all-purpose flour and 90 milliliters of water (1/2 of 3/4th a cup). 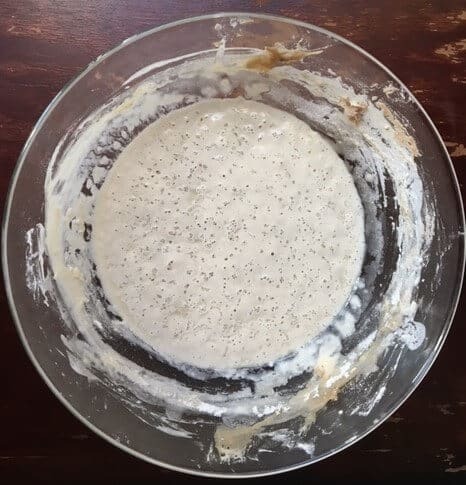 This is the sourdough starter on day 3, before feeding. You can see the yeast is bubbling, and there is some dark fluid accumulated on top. Stir down the starter thoroughly before discarding 1/2 cup and feeding. This is how the starter looks on day 3, after feeding with 1/2 cup of all purpose flour and 90 mils of water. You can see more bubbling and there’s a fruity aroma. 9. 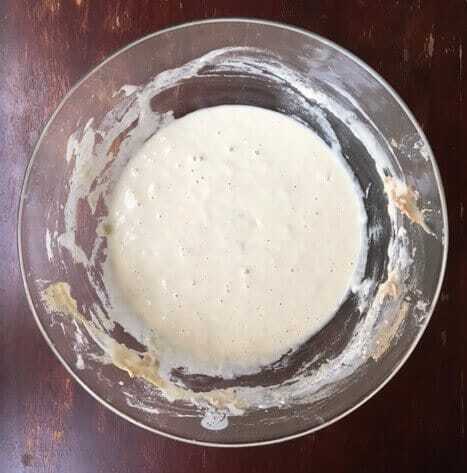 Continue the process for the next three days (try and do this at the same time of day– for instance, I began my starter Sunday morning, so I have to try and feed it around the same time every day, although an hour here or there won’t be amiss). Your starter should have started to thrive by now, rising after you feed it, and eventually settling down. 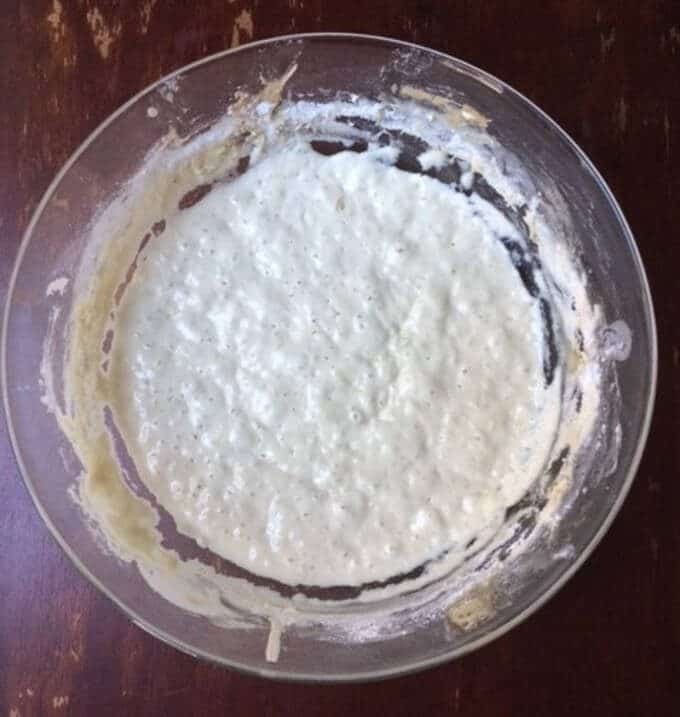 King Arthur Flour, where I got my initial recipe, recommends discarding and feeding your starter twice after day 3, but I found that doing it just once was okay, especially since it was quite warm when I made my starter. This time, with cooler weather, I might feed the new starter twice depending on how it goes. Here’s the sourdough starter before feeding on day 4. There’s a lot more bubbling, indicating we have some healthy yeast activity, and you can see some dark fluid on top. Mix thoroughly before discarding 1/2 cup and feeding. This is the starter about 10 minutes after feeding on day 4. It’s not easy to see in the photo, but there are more very tiny bubbles in the starter. 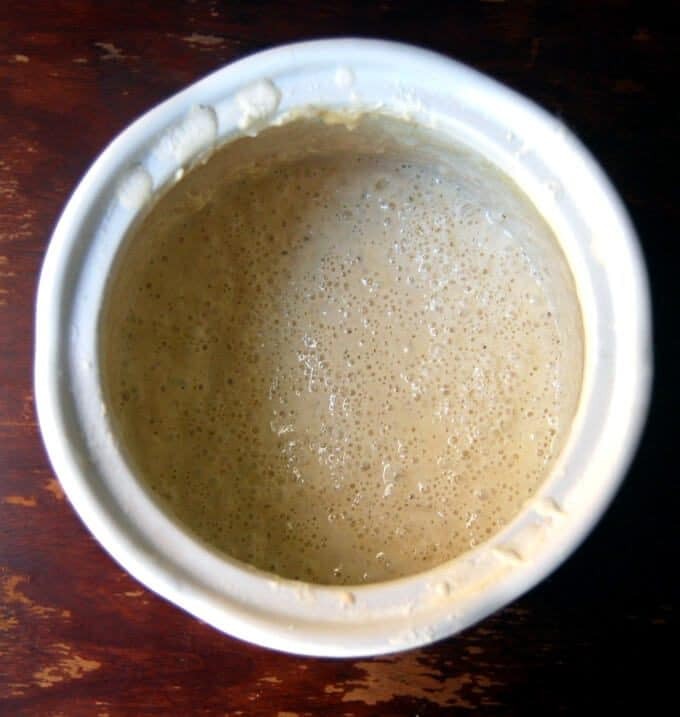 Here’s the sourdough starter on day 5 before feeding– it’s very bubbly today and getting stronger by the day. 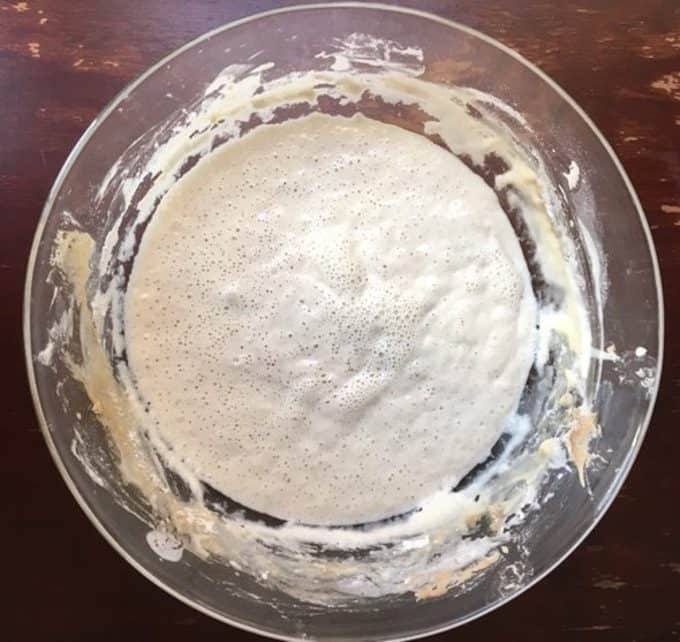 Sourdough starter after feeding on day 5. Although the starter is well on its way, I will feed it a second time later today, to help it gather strength faster in this cool weather. Here’s the sourdough starter on day 6, about two hours after feeding. You can see it has risen quite a bit and looks puffy and very healthy. I will repeat a second feeding today, and by tomorrow my sourdough should be ready to use. 10. By the seventh day, your starter, if it’s healthy and bubbling, should be ready to use. When I made George, I used the “discard” portion of the starter to make waffles, and they turned out great. If your sourdough starter is still slow in developing, increase feedings to twice a day and continue to keep it warm. It will eventually strengthen. 11. 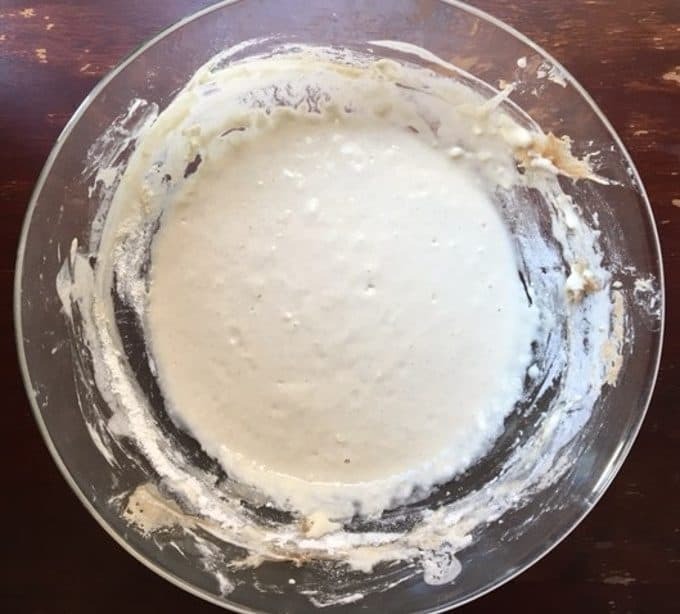 Once your sourdough starter has matured, you will need to feed it once every week. I mix the starter well, take out about 1 or 2 cups of sourdough starter to bake with (or you can just discard it), and replace it immediately in the proportion of 1 cup of flour to 3/4 cup of water. For example, if I take out 2 cups of sourdough, I replace it with 2 cups of flour and 1 1/2 cups of water. After feeding the starter, I leave it on the counter for a day, and then refrigerate it. 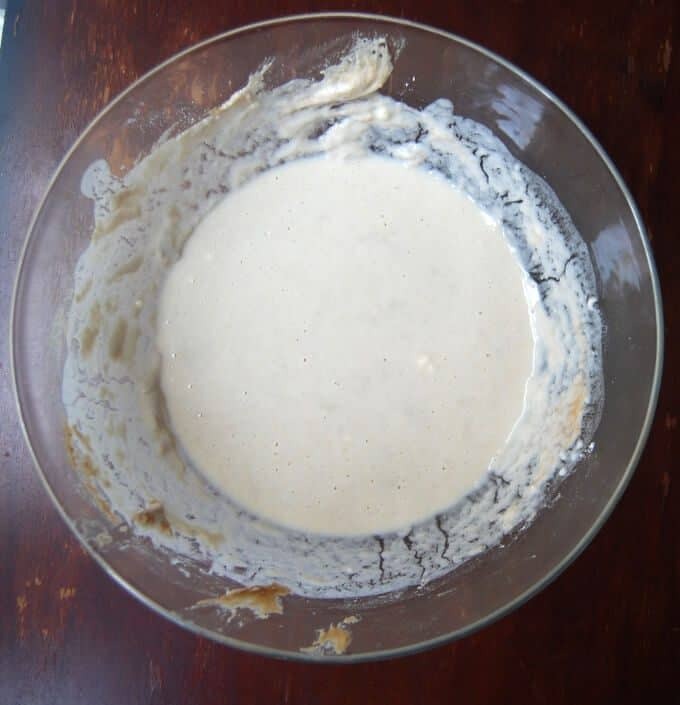 These are pictures of George, my mature sourdough starter, a day after he was last fed. You can see his is happy and bubbling and I have him in a really large crock so he doesn’t pour out. I will update this post with photos of the progress of my sourdough starter over the coming week. Keep track of it here, and let me know how your starter’s doing, or ask if you have questions. Are you excited? I know I am! 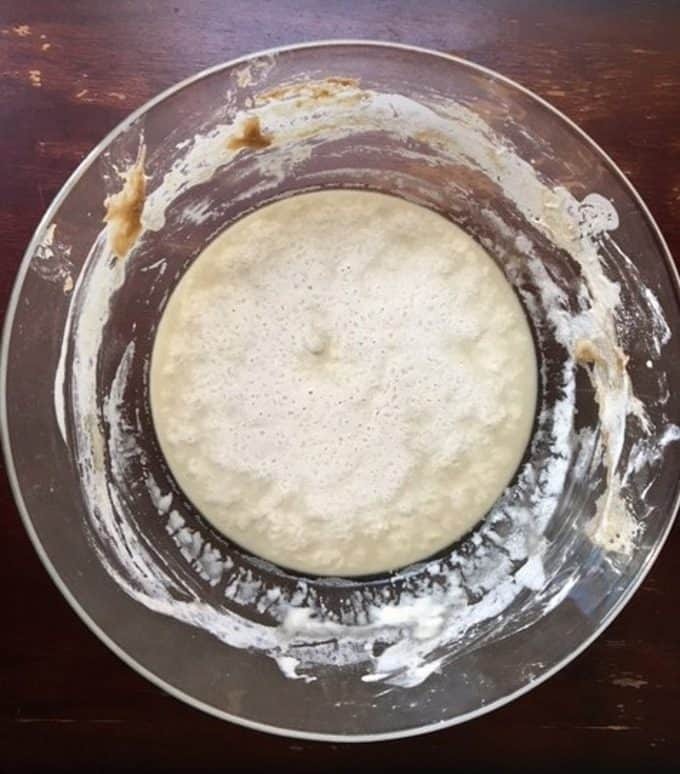 *Some of you have written to me asking about how to avoid the waste that comes with making a sourdough starter– you do have to discard a portion of it each day for the first seven days before you can use it. I tried an experiment this week: I added the discard portion to my chapati dough when I mixed it. It actually worked great, and the chapatis were softer with the added leavening. It’s a win-win because this way you also get the benefit of the healthy sourdough bacteria on a daily basis. 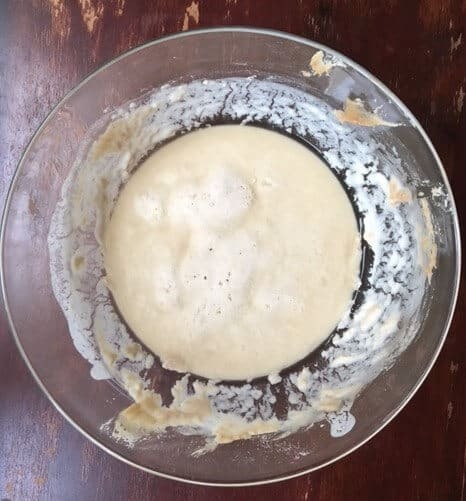 A recipe for a sourdough starter made with flour and water that you can use to make bread, pizza dough, waffles, pancakes, pretzels and much more, without any added yeast. Measure out the whole wheat flour into a large bowl or a crock (if you live in India, you can use whole wheat atta flour). The container you use should be large enough to hold the sourdough starter as it rises and bubbles. Also make sure you use a glass or ceramic or sturdy, food-safe plastic container. Measure out the bottled or non-chlorinated, room-temperature water. Chlorine can inhibit the formation and growth of yeast, so it’s rather important that your water be as non-chlorinated as you can get it. 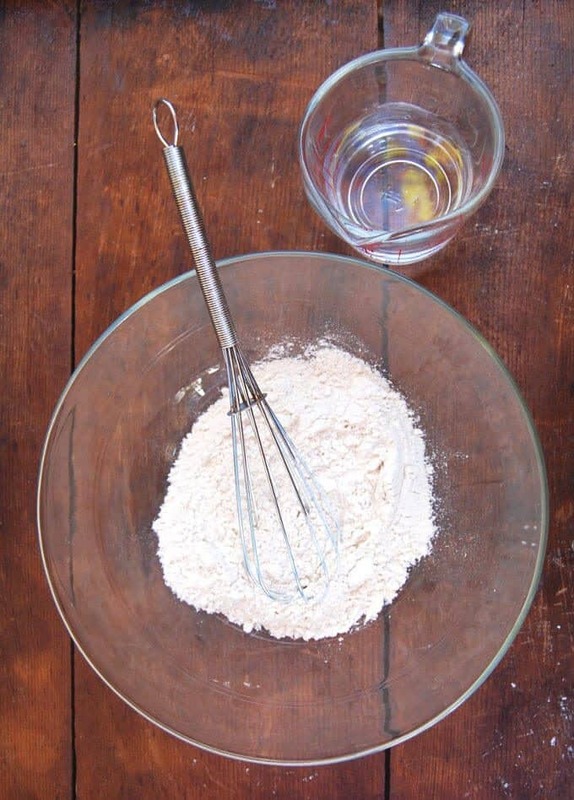 Now add the water to the flour and whisk together to mix well. 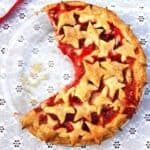 You should not have any traces of flour. 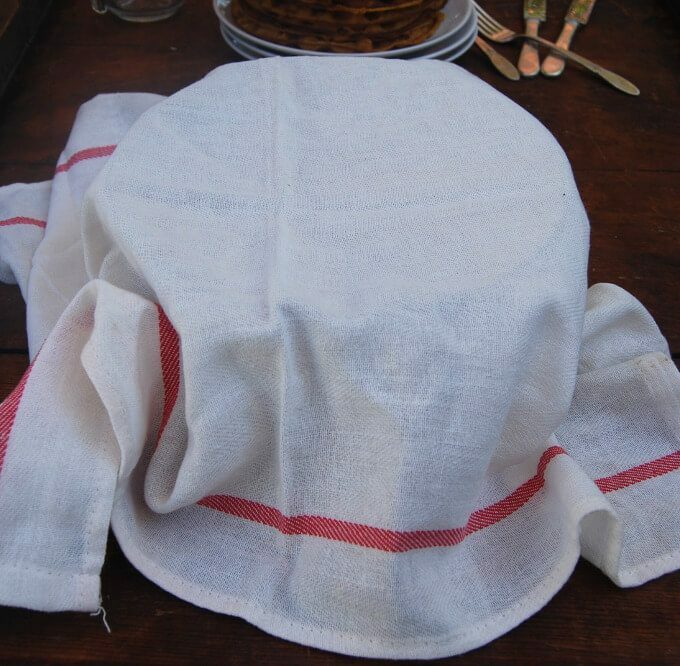 Cover the sourdough starter loosely with a kitchen towel. If the weather where you live is cold, place it in a warm spot, like on top of a radiator or in an oven with the pilot light on. It was rather warm here when I started George so I could leave him out on the kitchen table, but this time — with temperatures kissing the 40s — I have my new starter in the oven with the light on. Keep in mind that it may take longer for the yeast to develop in the starter in cooler weather. 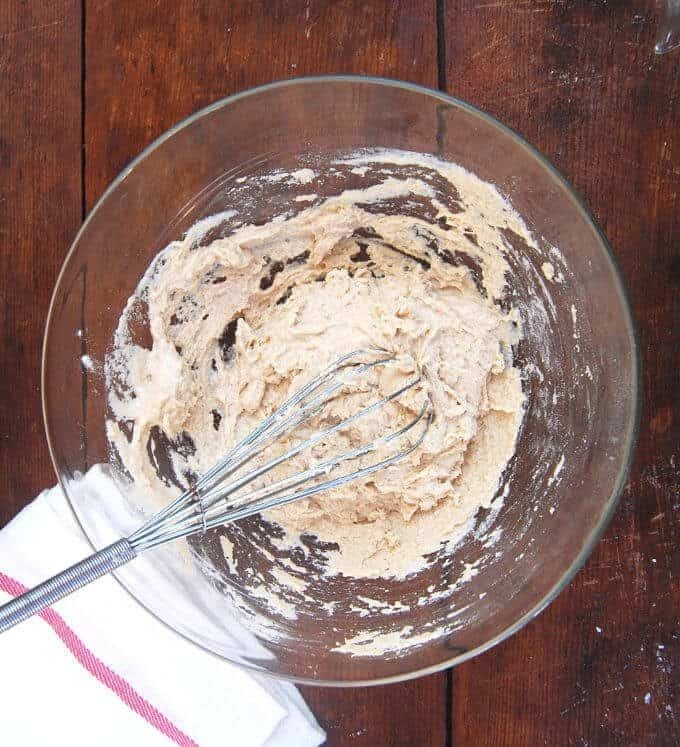 After discarding a portion of the starter, add half a cup of unbleached, all purpose flour and 3/4 cup of non-chlorinated water. Use warm water (not hot) if you are working in cool temperatures, as I am. Mix well and again, leave in a warm place. You will start noticing that your starter lightens in color with the addition of all purpose flour. By the third day you should see some activity in your starter and also a fruity aroma. Once again, discard half a cup of starter and add half a cup of all-purpose flour and 90 milliliters of water (1/2 of 3/4th a cup). Continue the process for the next three days (try and do this at the same time of day– for instance, I began my starter Sunday morning, so I have to try and feed it around the same time every day, although an hour here or there won’t be amiss). Your starter should have started to thrive by now, rising after you feed it, and eventually settling down. 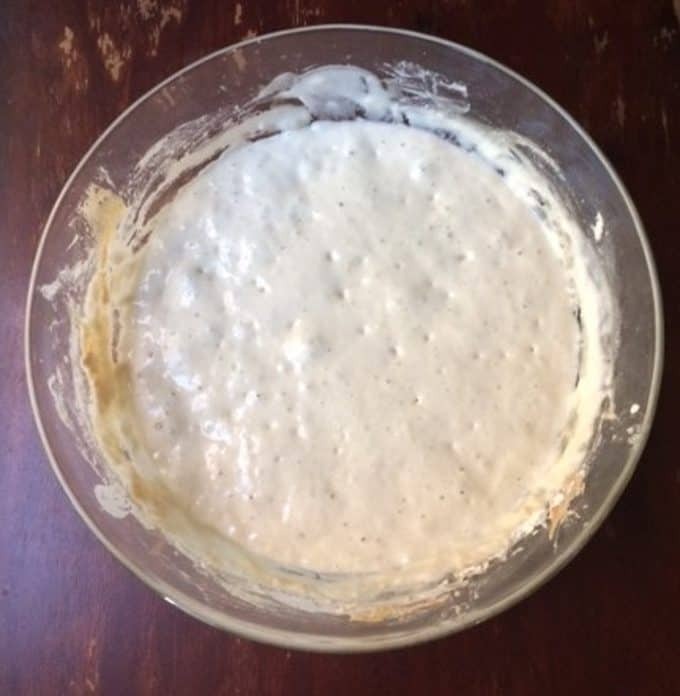 King Arthur Flour, where I got my initial recipe, recommends discarding and feeding your starter twice after day 3, but I found that doing it just once was okay, especially since it was quite warm when I made my starter. This time, with cooler weather, I might feed the new starter twice depending on how it goes. By the seventh day, your starter, if it’s healthy and bubbling, should be ready to use. When I made George, I used the “discard” portion of the starter to make waffles, and they turned out great. 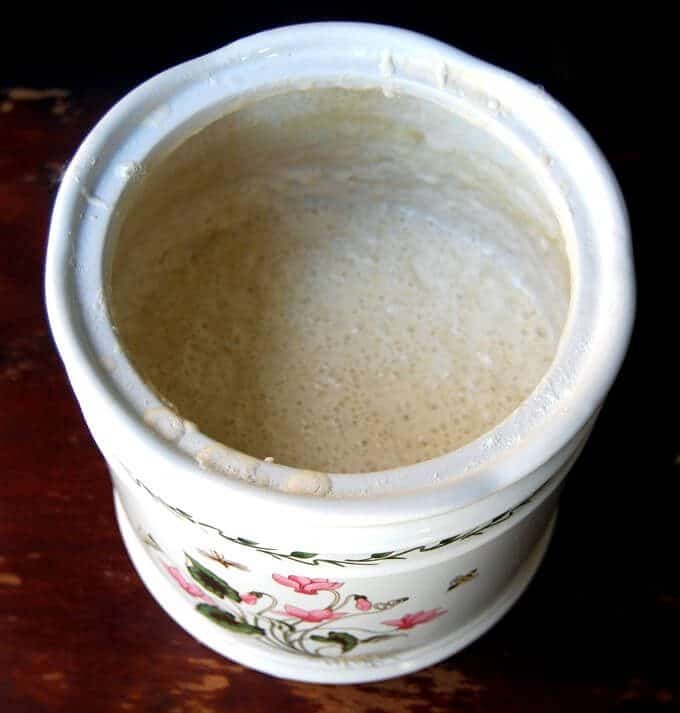 If your sourdough starter is still slow in developing, increase feedings to twice a day and continue to keep it warm. It will eventually strengthen. Once your sourdough starter has matured, you will need to feed it once every week. I mix the starter well, take out about 1 or 2 cups of sourdough starter to bake with (or you can just discard it), and replace it immediately in the proportion of 1 cup of flour to 3/4 cup of water. For example, if I take out 2 cups of sourdough, I replace it with 2 cups of flour and 1 1/2 cups of water. After feeding the starter, I leave it on the counter for a day, and then refrigerate it. What a lovely story! The Story Of George! You mention a portion. how much is a portion? Thank you! I will start mine today, I am so glad you’ll be updating with progress here. It seems an awful waste of atta – especially knowing how many others can do with it out here in india. Hi Pratibha, I feel your pain — but it is only for the first week that you need to discard the sourdough. After that you can use the discard portion to add to breads, waffles etc. because it will be strong enough. If you absolutely don’t want to throw it, perhaps you can try mixing it into your chapati atta? I can’t see that it would hurt, and chapatis and parathas don’t need leavened dough. The sourdough will start smelling a bit fruity, though, as time goes by, so make sure you mix it in with regular flour. Hello! I am on day 3, and things are going well, I think! I have baked my ‘discard’ portions and fed the resulting crumbly-biscuity things to my backyard hens! They seem quite happy to eat them as a treat, and are laying as normal. Thanks for the recipe, btw. Fingers crossed that I get to make bread next week that looks as fabulous as yours! 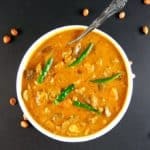 Do you have a recipe for chapati? Also, I’m weighing the flour when I add it: 1/2 c. = 4 oz. Is that about right? Hi Mary Jo, I don’t have a weighing scale, but according to the King Arthur website, 1 cup of flour equals 4.4 ounces. In that case, 1/2 cup would be about 2.2 ounces. Four ounces would be too much. Sean, that’s wonderful to hear. Glad you got your sourdough going, and liked the waffles. 🙂 Thanks for letting me know! 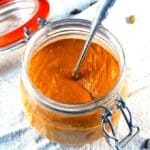 Can I use spelt flour as a sourdough starter ? Can’t say for sure because I haven’t tried this. When you take the starter out of fridge, do you need to let it get to room temperature before doing anything with it? Mix, discard (start bread etc. ), feed? Is it okay to start the bread with the cold discard amount? If I need to make bread etc. before the week is up can i? And if so do I just do the usual process? Can you tell me any way to get the 2 cups of it faster? You can definitely use it out of the fridge. If you make the bread before the sourdough starter is done, your dough won’t rise as well and you’ll get a very dense loaf. To increase the amount of starter, just add extra flour and water in the same ratio: 3/4 cup water for every one cup of flour. Can I put the starter in a jar and put tge lid on it? If not please help me to understand why not? Hi Linda, you can put the lid on it, but I find covering with a cloth napkin helps the flour and water capture the wild yeast from the air better. Hey! How about continuing another starter from the part you discard? Would it work? Yes, you can certainly do that if you want a second batch — or to share with family or friends. Thank you for all the clear descriptions and photos. Those help immensely. Question: you say to use while wheat flour to start but then not again in the process. 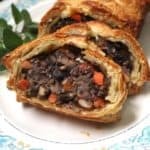 Can whole wheat flour be brought back in? If so, when and how? If not, why not? Thank you. I appreciate learning about this fermntation process. Hi Denise, I do occasionally feed the starter with whole wheat, although not all the time. You can try it– it should be fine. Hi! I’m currently on day 7 and I have some bubbles and dark liquid forming next day. It’s cold here 30-40°F. I’m thinking I should start feeding my little buddy twice per day. Any thoughts or tips? I’ve heard that it could take up to 14 days. Hi Sarah, your starter should be ready to use after a week. You can try using it in a pancake or waffle batter to begin with. I’d probably wait a couple of weeks before making bread. The dark liquid means your starter is hungry so feeding twice per day sounds like a good idea. I left my starter in the fridge longer than a week and there was dark liquid which some research said meant it was hungry. I was able to save it but it didnt make very good bread so i had to start over. Really? I’m so curious about this! I’ve tried using it for bread already and it just leaves me with a gooey batter mess, not like dough at all. I’ve been wondering why. What will waiting another week or 2 change? I assumed I failed at making the starter so this is very exciting. I’m still feeding it (and discarding) and it’s been almost 2 weeks but I don’t have that foamy bubbliness you mention. Hi Sarah, does the starter bubble a few minutes after you feed it? If not, your starter is off. Are you keeping it in a warm spot after feeding, for a few hours? 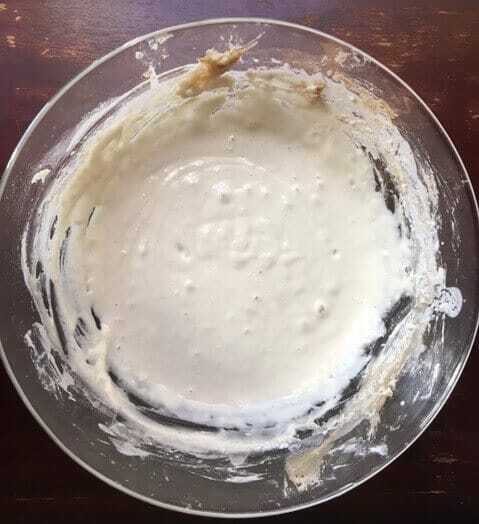 Look at the photos and see if your batter, after a few minutes, looks like that. Otherwise I would advise starting over. Also, your bread dough should not be a gooey mess, even if something is wrong with your starter. Could be you are using too much water. Hello, thanks for these directions! I forgot to discard half a cup before feeding tonight (day 3) so far it’s been going well but have I just ruined it? I think you should be fine! But do remember to discard at your next feeding and thereafter. Quick question, instead of all-purpose flour, can I use whole wheat flour to feed the starter on Day 2.. So for the 6-7 days it takes to mature it, should it always be out in a warm room/oven and never in the fridge? then onwards is kept in the fridge and only stays out 24 hr once weekly after feeding, right? Just concerned about any contamination by unwanted moulds or bacteria??? Hi Montserrat, the sourdough shouldn’t get moldy within the 6-7 days– it’s never happened to me. And yes, keep it out for a day after each feeding, or even 12 hours is fine. Cheers. 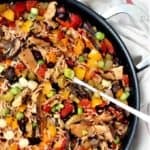 Can this be done in a crock pot or instant pot? I don’t have anything else to keep it warm. Thanks. thank you for sharing this excellent information here, very clearly explained with excellent photos. Do you have a recipe for a wholemeal 5 seeded sour dough bread? You state to add 90 ml of water (1/2 to 3/4c) to feed the starter, but 90 ml is only 3 ounces. What percent of hydration do you find works best? I don’t have all purpose flour. May I substitute bread flour instead? I’m on day 4 and mine has started is looking so good! There’s a definitely rise and fall and lots of bubbbly activity. It was weak the first 2 days so I did double feeding on Day 3 and it really responded well to that. I was also worried because of the big arctic chill hitting the midwest, but my crock sits by the oven and gets a lot of humidity and heat from when I cook breakfast and dinner. My 2 year-old help me with it and she named it “ice cream” I think because she’s hoping that is what we were making! ha! Can all purpose flour be substituted for the whole wheat flour? My starter on day 1 was watery and had that blackish color. I did everything you said to do. Idk what is going wrong. I fed it a little sooner on day 2, reading that the black liquid meant it is hungry. Do you think it is off already? Not many bubbles at all. Thank you. Is it bad if a thickish skin forms on the surface on day 3 and 4? I’m keeping my starter in the oven with the light on. It’s about 85°F in there. Thank you. Please… How does this starter (1 cup) end up being able to provide the amount needed in your bread recipe, and still have enough starter to keep it going? To make a bread, you’ll need to use more flour and a small portion of the sourdough starter, per the instructions on the recipe. Hi, i’m not sure how the “fruity ” smell should smell but everyone says it smells like someone has been sick. Is this the correct smell ?!!! !